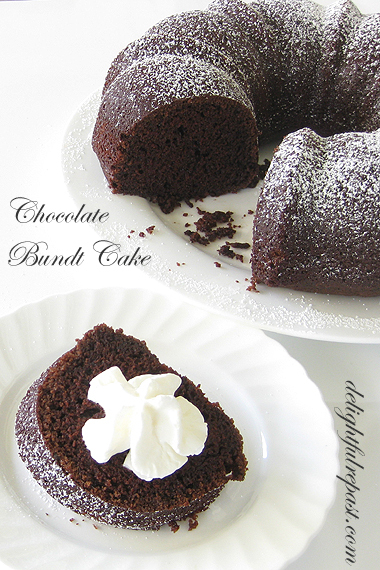 Everybody needs a good recipe for Chocolate Bundt Cake. Most are quite dense and heavy, which can be good. But mine is one for those times when you're in the mood for light and fluffy, even in a Bundt cake. And it's quite quick and definitely easy, with no special equipment required. You just need a little saucepan to melt the butter and stuff and a big bowl and spoon to give it a quick mix. Bakes in just 40 minutes. It has plenty of chocolate kick on its own (enhanced by using coffee as the liquid), so I just gave it a dusting of powdered sugar and a bit of whipped cream. Chocoholics could stir up a little ganache to ladle over the top. Oh, and if you're vegan and/or interested in foods of the Great Depression, or if you just want an easy single-layer cake, check out my One-Bowl Chocolate Cake. Are you a Cake Person or a Pie Person? Many people think you're one or the other, but I think I'm both! 1 In small saucepan, combine brewed coffee, butter, cocoa and salt. Cook, stirring, over medium heat until butter is melted and mixture is smooth. Set aside to cool slightly, then stir in vanilla extract. Stir vinegar into the yogurt. 2 Preheat oven to 350F/180C/Gas4. 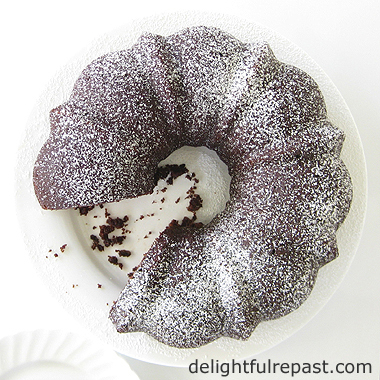 Grease (1 tablespoon butter) and flour (1 tablespoon cocoa powder) a 10-inch 12-cup Bundt pan. Or just spray the pan with cooking spray, if that works with your Bundt pan. 3 In large bowl, whisk together flour, sugar and baking soda. Add the melted butter mixture, half at a time, stirring after each addition until combined. Add the eggs, one at a time, mixing after each addition until well incorporated. Stir in the yogurt mixture. 4 Scrape the batter into the prepared Bundt pan. Run a knife through the batter a few times to break up any large air pockets. Bake for about 40 minutes, or until a toothpick inserted into the center comes out clean. Cool in pan on wire rack for 10 to 15 minutes; then turn out onto wire rack to cool completely before glazing (ganache would be good!) or dusting with powdered sugar. “Chocolate kick.” Yes. This is why I call it a punt cake. And there is that powdered sugar again. But you do make it sound good. I’m willing to believe – I believe, I believe – that your version escapes my previous experiences. The cake will not be crumbly, the stuff ladled onto the cake will not taste like watery chocolate, and the powdered sugar will not attack like a toxic inhalant before it even hits the taste buds. (I do believe, I do believe…) However, a good lemon meringue pie cures all frailties. Just sayin’. Chocolate and coffee are a dream team, ain't they? This is a very beautiful bundt cake. Sully, I assure you I apply powdered sugar with a *much* lighter hand than most people! It's only there to "break up" the mass of brown, especially for photos. I don't like that whole asthma-attack-of-powdered-sugar thing either. And it is not at all crumbly, and I would not apply a weak and watery chocolate glaze; as I mentioned, it would be ganache. I'm quite certain you would be happy, as long as you weren't required to wash it down with a nice cuppa tea! Thanks, Angie. And, yes, they are a "dream team!" I'm so amazed at your Chocolate Bundt Cake, it's really a work of art, darling Jean, so perfect and ... delicious, to see and to taste, I'm sure ! Chocolate is so wonderful and this cake is perfect to satisfy that desire! Thanks for sharing something delicious! Dany dear, thank you. It must be beautiful in Italy right now. Hugs across the miles! Thank you, Bernideen. I always love your tea in the garden link party! Jean, this beautiful Bundt cake is definitely calling my name!! I do have a chocolate Bundt standby (serves many . . . and chocolate is a crowd-pleaser among my group), but I love the simplicity of the ingredients in yours. I will be giving this a try soon! Thank you! Thank you, Cheryl! I hope your group of chocolate fans like it as much as we do! Sounds delicious! Great recipe. Definitely trying this one! Jean, the chocolate bunds cake looks delicious. I love chocolate anything...thanks for sharing! David, thank you! Let me know how it turns out for you. Thanks, Pam! Everyone seems to like chocolate! I guess if I HAD to choose, I'd pick pie over cake, but this chocolate bundt cake sure looks tempting, Jean, and it's so pretty. Kitty, thank you! It would be an easy one to make with the grands, too! Thank you, Maristella! Chocolate is the universal language! I'm definitely a cake person! Chocolate cake is one of my faves! Margie, chocolate *any*thing was my fave for the first half of my life. 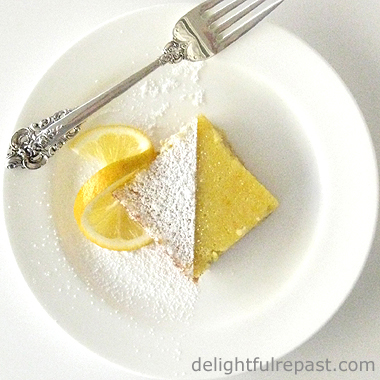 Now I lean more toward vanilla cake, but it's all good! I think I'm more of a pie person although I do enjoy a good cake. When it comes to cake, I lean more towards a naked cake although who can resist a good boiled icing or that German chocolate frosting? Yours looks wonderful, by the way! Thanks, Sandi! Most of the time I scrape off the frosting - I don't want the extra sugar, and there's *always* someone eager to take it off my hands! 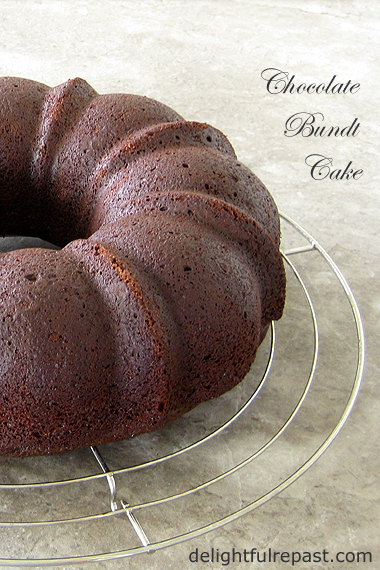 Your Bundt cake looks amazing! It looks so delicious, this could not be more perfect! In fact, I would love to have a slice with my black tea now! ! Jean, can you tell me how much is 3/4 cup of yogurt in grams? Hi Jean. You mention recipes of The Great Depression. Did they produce recipes especially for that time? My mother, who is still alive, she is 93 years old, often tells me about the war years here in Britain. We had something called ,rationing. In fact , when I was born, I was provided with a ration card for the first year of my life!! Oh, and yes, your bundt cake looks incredible as usual. Just thought about what I wrote before, Jean. It is a ridiculous question. Did people write, Depression, cook books? Of course they didn't. It was an economic disaster. People starved and were made homeless. The Home Front during WWII in Britain was managed and planned. Britain became a well oiled machine. Wish it was now.Ha! Ha! I have two bundt pans and I rarely use them. Your chocolate cake would make a perfect candidate for one of the pans. I really like your use of coffee and chocolate. The coffee enhances the flavor -- so yummy!! I bet a nice slice would be perfect in the afternoon with some tea. I don't drink coffee in the pm -- I love coffee but I don't want to stay awake all night. :-) I'm pinning to make the cake. Oh! I can eat pie or cake -- I like them both. Have a great weekend. Thanks, The Reader's Tales! I don't know how I missed putting in the grams for the yogurt - thanks for letting me know - I've added it now. It's 170 grams. Tony, yes, there was rationing in the US during WW2, starting in May 1942. I no longer have my "experts" from that era to consult, but I believe the rationing included things like gasoline (petrol) and some other non-food things, as well as meat, fish, cheese, butter, eggs, canned milk, sugar and coffee. So cooks came up with "war" recipes just as they'd come up with "depression" recipes. You'll see my Chocolate Depression Cake has no butter or eggs, and yet it has a perfect texture! Thanks, Marisa. And I hope you'll put one of those Bundt pans to use very soon! It would be shame to leave them idle! I can't drink coffee at any time of the day; it does terrible things to me. And yet the caffeine in tea does not bother me at all. This DOES look quick and easy! I need to search your blog to see if you have a madeleine recipe! Thanks, Jeanie! I like to use a mixer for things like whipping egg whites, but when something can be made by hand without winding up with a bunch of stuff to handwash ... well, that's what I like to do! And, of course, I have a madeleine recipe! I'm a big fan of light and fluffy. If I had to choose between cake and pie, I'm pretty sure I'd pick cake. But pie is a close second. Pauline, then you will like this more than most chocolate bundt cakes. I find most are not light and fluffy, which I love. You make the simplest recipes look amazing. If I was honest I would be a pie and cake person. I have found some discipline these days, so a little of each. Love them both and I am a chocoholic! Looks delicious! Thank you so much, Kathleen! And I like to make every recipe as simple as it can be and give enough details to make the complicated recipes doable. Thanks, Cathy! I'd like a piece right now, and I froze half the cake right away, but I'm saving it for company next month. Hi dear friend. Thanks for "finding me." It is great to visit with you this evening. I have been hungry for chocolate cake and I like that this recipe is light. Like you, I love both pies and cakes. lol You have always been so kind to comment on my cats.....did you know we rescued another kitty and named him Jellybean?? He is young but required a back leg amputation but he is doing just fine. Thank you again for stopping by and I am following you now. Thank you, Mildred. I've missed out on Jellybean! Thanks for letting me know so I can check him out. You are right, Jean! I do need this recipe! My bundt (cinnamon chocolate) is too dense and way too dry. It turned me off bundts for a long time. Can't wait to try it! Jean, this is a wonderful delicious looking bundt cake. I love the chocolate and coffee combination. Thanks, Gerlinde! Yes, chocolate and coffee are one of those classic combinations. Me. too, Greg -- how could one choose! Thanks, Dawn. And I wish I could say, "Put the kettle on; I'm bringing the cake!" Cake? Pie? Cookies? Bring 'em on! Especially chocolate -- thanks for this yummy-sounding recipe. Thank you, Nickie Jim! I like them all! Yum. Always a delight to read your posts! Thanks so much for sharing your great party with us at Full Plate Thursday, I really appreciate you sharing with us! Hi Jean, your chocolate cake looks awesome! Anything with chocolate is great! Thanks so much for sharing your chocolate cake at Dishing it & Digging It. Thanks, Linda! Awesome AND easy! You know me Jean, I am the one who prefers white cake over chocolate. :) It sure does look pretty though! Thanks for sharing with SYC. Me, too, Jann! I make chocolate cakes for other people and vanilla cakes for ME! This looks delicious! Saving this recipe. Thanks so much for your visit! Thank you, Ruth. It's a real favorite around here. We love our tea and bit of cake! Annette, thank you! Yes, perfect for afternoon tea because it's really quite light. I used to be a pie person years ago, but today I am a cake person. And this is a cake recipe I would love! Looks delicious! Thanks, BRnLC. And it's funny how some people can change "camps" like you, and others stay just one or the other! Thank you, TRT! I like it unfrosted for two reasons - less sweet and, as you mentioned, easy to carry for a picnic! Rue, thank you, that makes me so happy! I haven't made it in a while, thanks for reminding me. Friends coming next week love it.